Auchincloss (Her Infinite Variety, 2000, etc.) 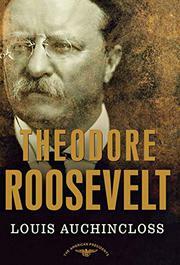 trains his acute sensibility and elegant prose on our most colorful chief executive, rendering Teddy as a man of his time as well as a timeless example of principled leadership. Auchincloss argues that Roosevelt’s bluster was his most human trait. The first president of the 20th century was given to loud talk and exaggeration. So what? asks the author. It masked his political shrewdness. To understand Roosevelt, one need only understand the policeman’s ethic, writes Auchincloss. Before all else, Teddy did what was right. And he enjoyed coming down hard on those who did wrong. His concept of the gentleman was tantamount to a chivalric code, right up to a man’s duty to fight for his country. Roosevelt insisted on expanding the American Navy, using its battleships on the international stage, and gladly sent his sons into WWI and WWII. He insisted on boxing with younger and stronger army officers, one of whom blinded him permanently in the left eye. Like a cop, Roosevelt was often bull-headed in his pursuit of what he thought was the right course of action. This stubbornness caused him trouble at the outset of WWI. First, Roosevelt gave the White House to the Democrats by opposing business-friendly Taft and splitting the Republicans. Then the ex-president had to put up with university professor Woodrow Wilson leading America into war. After Wilson ignored his predecessor’s request to lead a cavalry regiment against Germany—a foolish desire, given that Roosevelt had only a few more years to live—Teddy spent much of the rest of his life fulminating against the administration, one arguably more progressive than his. Auchincloss quotes extensively from Roosevelt’s writings, which are as awe-inspiring and dramatic as any novelist’s. It’s a wonderful way of bringing this giant to life on the page. A master craftsman’s rendering of a character who needs no embellishment.